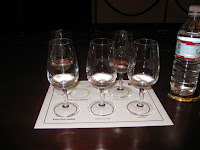 In the last week I’ve gone from wine tastings to vodka tastings and found that surprisingly they are quite similar. 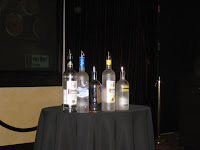 At the Ketel One U.S. headquarters in Aliso Viejo, Calif., I was able to do vodka tastings of Ketel One, Grey Goose and Absolut. I’ve never heard of or done a vodka tasting before, well except for the amateur college variation of shots of generic vodka while abroad in London. Apparently for proper vodka tastings, the white spirit should be kept at room temperature, and 7 a.m. is the best time since that is when your palate is clear and not tainted with breakfast or coffee, etc. My tasting occurred around 3 p.m. though and I had a Jack in the Box sandwich for lunch. First, we swirled around the liquor in our tall wine-like glasses to see the legs and inhaled the fragrance contained in each glass. A stronger smell means that the alcohol is purer and that impurities have been removed. Absolut smelt the sweetest, Ketel One the strongest, yet was the smoothest to sip down. Normally the first sip of alcohol is a shock to the system, like a shot if you will, which is normally why brands would like you to try their product last because you’ll be more used to the taste by the time you try it. However, the Ketel One employee encouraged us to try theirs first. It was a shot to my system, but a pleasant one that didn’t deserve my initial body bracing as I attempted to drink the wheat vodka straight. We then smelled and swirled Grey Goose, which I was always told was the best premium vodka, yet it didn’t go down as smoothly as Ketel One’s imported vodka, yet it did smell nice. 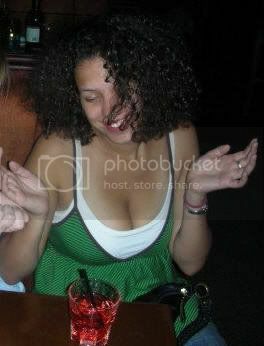 As I mentioned, Aboslut had smelled the sweetest, but was a devil to drink straight. I swear I did the tart face reaction similar to when I drank that garlic wine. So from now on, I’m not being suckered by Aboslut’s fun advertising or Grey Goose’s high prices. We then moved on to the citron flavored vodkas--Ketel One Citroen and Absolut Citron. Ketel One (K1) smelled nice and citrusy, but it was hard to detect the citron in the Absolut. The K1 Citroen was nice and yummy I could even see myself having that baby on the rocks, well maybe with club soda. I didn’t even want to drink the Absolut after tasting their regular version, but this time I wasn’t as surprised when it tasted yicky and despite the fact that I’m sipping straight alcohol I had to take another sip of the K1 just to rid the bad taste from my mouth. That’s the weird thing about vodka tastings, it’s intense. With wine I have no problem sipping away and finishing my taster, yet when it came to sipping vodka I only had one sip per glass, except for the latter mention that is. Hmm what are some other things that I learned from the vodka tasting...oh, potato vodkas are the hardest to purify because of the starch and the Holland-found Ketel One is a family run business that has passed from father to son since 1691, over 300 years! 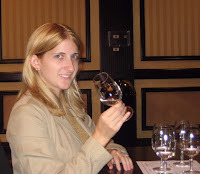 Yet, the 11th generation’s Carl Nolet, Jr. said the next generation very well could pass on to a female Nolet :) Again, I wish I grew up on a family run vineyard and now a sprits company! Wow, I had never heard of vodka tasting. That sounds intense, 7 am and straight vodka, impressive, haha. Sounds like a good time for sure. ugh, the garlic wine reference from Stinky Rose just made me throw up in my mouth.